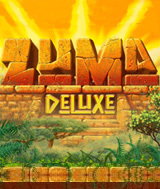 Unearth the ancient secrets of Zuma™, the award-winning puzzle game. Deep in the jungle lie hidden temples bursting with traps and trickery, and it´s up to you to uncover their treasures. Fire magical balls from your stone frog idol to make matches of three or more and clear the deadly chain of spheres before it reaches the golden skull. Explore all the temples, and if you´re good, you´ll rack up huge combos and special bonuses that´ll help you on your way. But think fast and aim smart, or you´ll be history in this action-packed puzzle challenge. Comments: A very addictive game, fun to play. change the color of the balls as soon as you can to get more points, try for the coins.